I have been assisting in a grade 3 classroom every Friday for the past month. My job: train students how to go through the steps of an iPad math creation station. The goals: 1) the current math student learning objective and 2) independence! We took the time to set expectations and to show students the process step by step. There were no assumptions that the students just should know what to do. They were shown slowly, and those that completed steps quickly became helpers. Students were empowered. Not only did we ask students who caught on quickly to be helpers, when appropriate I would be flexible and give a next step tutorial to them. Once they completed the steps, I asked them to lead the overall demonstration when other students were ready. This modeled what should be happening at the station: help each other out without doing it for someone as well as seek out friends or “experts” if you are struggling. The classroom teacher created an example each week. She showed this example to students as a part of her preview of each of the stations in the room. This preview gave students an opportunity to see expectations and ask questions like they would any of the other stations before actually being at the station. The heads-up is great for relieving anxious students, too! The teacher gave time during the week for students to do a little prep work, if necessary, such as cutting out shapes, jotting down notes, etc. so that they had the necessary materials at the station. Creating on the fly is an important skill; however, it was bogging down the station. Coordinating with support teachers to be available to work at the station with specific students has helped a lot. Students who struggle with multiple steps and reading are having their needs met, and we have found that they now are shifting toward more moments of independence at the station. The teacher did her own prepping for the station. Taking time to consult with me about any adjustments with a focus on keeping it as consistent as possible, learning how to make copies in her Google Drive in her math folder, making a physical binder for students to keep the direction sheets, having clipboards out with the latest check list and thinking about the best groupings of students to visit the station first have been extremely beneficial to the success of the station. The procedures and apps used have remained the same each week. I talked with the teacher about how the technology was not the focus. Finding a good app(s) and sticking with them was crucial. The only thing necessary to change was the objective each week. Some worry that the students will become bored. Nope… we haven’t seen that yet. A consistent workflow with no hang-ups about procedures and learning new apps is demonstrating what the students know in math. This aspect is very important for those students who struggle with multiple steps and reading, making the acquisition of the routine much easier. The station is math formative assessment at its best! I’m sure there are many more things that haven’t even been realized yet. I am very encouraged by what I am seeing in this classroom. I feel like I am more of a coach at the station now, identifying kid’s specific procedural areas of weakness and clearing up confusion so they can get on the right course. I hope my thoughts are useful as teachers work on setting up guided math and stations in their classrooms. Please share any of your own experiences in the comments! Plan and create four talking avatars about the math learning objective using Chatterpix Kids. Put the four videos into a media collage using PicPlayPost. Share your media collage to the teacher’s assignment in Google Classroom. A big congratulations to Mrs. Kelly and her students for an awesome job in getting this Station Rotation Model to work so well! I am always on the look out for a way to record student thinking. Recap was introduced to me as an iPad app at the Innovation Summit this month. While it certainly fits the bill for reflection in all subjects, space in our Creation folder on our iPads is prime real estate. Too many apps on an iPad becomes a management nightmare as well as a digital memory issue. Therefore, I was psyched to learn it is Chromebook friendly! Please check out Recap in this video below. Super easy to set up and use with young students (the Pin option!). There’s even a great summary feature (Daily Review Reel) you don’t want to miss! Recap Quick Start from Swivl on Vimeo. So what do you think? Ready to make one and assign it in Google Classroom? A month ago, I watched a great SimpleK12 video, “Creation Tools for Web Browsers: Projects for Students on Chromebooks” presented by Monica Burns. One of the tools mentioned was Adobe Spark. At the time I was intrigued, but in consulting with various teachers, I didn’t push it as there were other tools that seemed to be more fitting for meeting current student learning objectives in their classrooms. I have learned over the years not to get too crazy about trying out EVERY new thing. (Yes, I was a free app hoarder for a while… <sigh>.) Essentially, find a tool you like and really try out its potential. If it’s a good one, the tool will help reach many goals that you have. 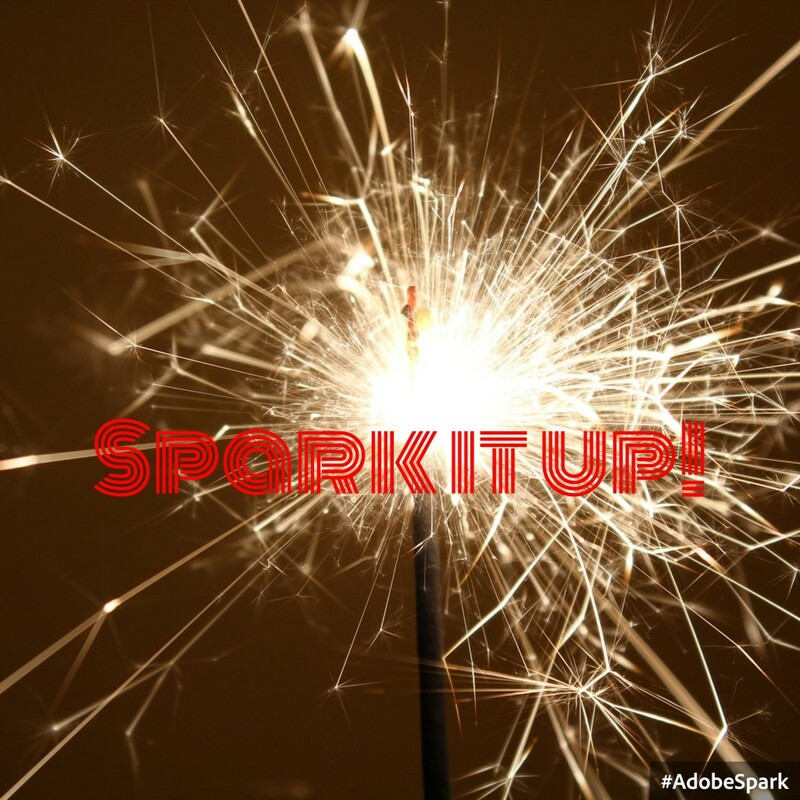 Fast forward to the MassCUE Conference last week where I noticed that Adobe Spark was a workshop being offered. Also, the presenter was no other than Monica Burns! I admit a little celebrity-itis hit, and I had to go see her in person. Boy, was I glad I did… it gave me a chance to explore a little deeper with the Adobe Spark products and discover how great they can be for education. There are 3 options: Post, Page and Video. Post is more socially minded… think 140 characters… getting a short message out… summarizing with an eye-catching visual… showcasing a vocabulary word. Here’s an example from the site. See more about Post here. Page is poster-like, but with web page navigation. Photos, text and links can be shared to an audience on-line. Here’s an example from the site. See more about Page here. Video is exactly what it implies with visuals, animation, sound and music. Here’s an example from the site. See more about Video here. All of them are so easy to use and FREE! You can supply your own images or use built-in ones. Music is the same way. Video even produces a credits page. One thing that I was very impressed by were the templates. Video had quite a few that were so student-friendly with guiding suggestions for analyzing characters and events. All three options are web based, so a Chromebook is perfect. You also can download them as separate apps for iPad. It seems reasonable that since we are a Google Apps For Education district, and our student accounts have all been created by us and we supervise these accounts that our elementary students could use the Adobe Spark service by logging in with their school Google accounts. Yesterday, I read a jam packed post from SimpleK12 about using Google with students. I am passing along the link to that post in my blog today as I think it’s a goody that should not be missed! Go here to see the 7 Lesser-known Google Ideas for the Classroom by Kimber Thompson. There are some great, short videos for the various ideas to check out, too, if you don’t want to get bogged down with reading! Busy, busy, time of year for all of us! Let me know if you see anything that you’d like to try.